IFF-7300S Series IFF/Crypto/TACAN Automated Test System | VIAVI Solutions Inc. 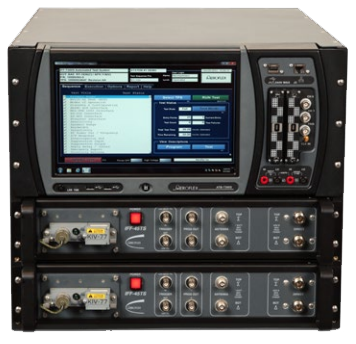 The IFF-7300S Series is a powerful computer based system designed for the test and diagnosis of military avionics, including IFF transponders, interrogators, cryptos, and TACAN transceivers. 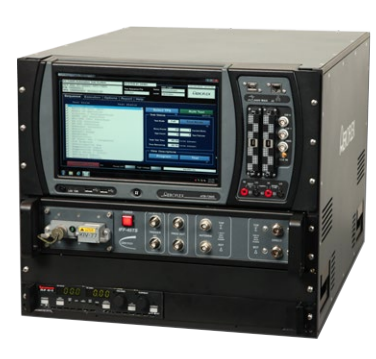 The IFF-7300S contains all required resources and emulates all signals required to verify proper operation of the Unit Under Test (UUT). The IFF-7300S-01/02 Test Systems are designed to test IFF Mode 4 UUTs and TACAN receiver-transmitters. The IFF-7300S-03/04 Test Systems are designed to test IFF Mode 5 UUTs and TACAN receiver-transmitters. The -01 and -03 versions have the DC power supply, needed for testing the majority of UUTs, and the -02 and -04 versions have the AC/DC power supply for UUTs that require AC power, such as the APX-72. Versions -03 and -04 can be expanded to test crypto appliqués by adding an external IFF-45TS. The IFF-7300S-50 is a dedicated cryptographic appliqué test system configured with two IFF-45TS’s. Automatic UUT control guides the operator through the key load process. All status flags are displayed simultaneously with red/green indication. Automated back-to-back testing offers significant time savings over manual testing. The system can be expanded to test military IFF and TACAN radios by adding an optional external power supply. The power supply is located externally (outside the rack).